Mechanical engineers design and build the machines and devices that make everyday life possible. An online mechanical engineering master's degree leads to employment opportunities in some of the newest and most innovative industries. The Bureau of Labor Statistics projects that the industry will experience 5% growth by 2024, which is on par with the national average. Graduates are prepared for careers in a variety of manufacturing settings, including transportation and safety, alternative energies, aerospace, healthcare, nanotechnology, robotics, and manufacturing. Online master's in mechanical engineering programs emphasize mathematical and computer expertise, practical engineering, problem-solving, creativity, and the ability to work well under pressure. Stanford’s Center for Professional Development offers many online degrees that are designed for working professionals. The center offers a 45-credit MS in mechanical engineering, which prepares students to work in specialized engineering fields. The program emphasizes design that is human-centered and sustainable within the department’s five academic themes: biomedicine, computational engineering, design, energy, and multi-scale engineering. Coursework in the online master's in mechanical engineering includes the study of breadth and depth in mechanical engineering, advanced dynamics and computation, feedback control design, and patent law and strategy. Some on-campus attendance is necessary for courses with a required lab component, and some classes may not be offered online. Part-time students complete the program in three to five years. Admission requirements include a BS in engineering, physics, or a similar science program; GRE scores; and official school transcripts. The University of Florida has a catalog of more than 170 online degree and certificate programs. UF’s EDGE (Electronic Delivery of Gator Engineering) program offers online degrees from seven engineering departments. The MS or ME in mechanical engineering is a 30-credit program that offers thesis and non-thesis options. Three specializations are offered: dynamics, systems, and control; solid mechanics, design, and manufacturing; and thermal science and fluid dynamics. Coursework for the online master's in mechanical engineering degree varies by specialization. Required courses include study in applied mathematics, numerical methods, and statistics and data analysis. Students can complete the program in two years. Learners decide how many classes they want to take each quarter. General admission requirements include a bachelor’s degree with a minimum cumulative 3.0 GPA for the last 60 credits and GRE scores. Mechanical engineering was the only program that Georgia Tech offered for the first eight years of its existence. Course material, like lectures and student-faculty interactions, for the 30-credit MS in mechanical engineering online is available on-demand or can be downloaded at a later time, enabling students to learn on their schedule. Coursework in the online master's in mechanical engineering includes computational science and engineering algorithms, orbital mechanics, aerospace systems engineering, data and visual analysis, and power systems and central operations. Online learning involves student interactions with peers and faculty members through telephone, e-mail, and threaded-discussions. Students can enroll in the program part-time or full-time. Up to six credits may be transferred into the program from a regionally accredited institution. Program admission requires a bachelor’s degree in mechanical engineering or a related engineering degree, GRE scores, and an outline of the student’s intended area of research. Columbia’s Mechanical Engineering Department, established in 1897, has a reputation of excellence. Through Columbia Video Network, distance learners can earn the 30-credit MS in mechanical engineering completely online. Students work with an adviser to develop a plan of study that reflects their interests. Coursework in the online master's in mechanical engineering may include thermodynamics, mechanics of solids and fluids, manufacturing engineering, dynamics and vibrations, robotics, and power generation. Math coursework includes applied math, partial differential equations, and probability and stats. All of the department’s faculty members are involved in research, are editors of professional journals, and leaders in the field’s professional societies. Admission requirements include a bachelor’s degree in mechanical engineering, a minimum 3.0 GPA, and GRE scores. Online learners pay the same per-credit tuition regardless of residency status. Students with a degree related to mechanical engineering must obtain department approval to fulfill the admission requirement. Online learners receive academic and technical support. John Hopkins' school of engineering (JHE) offers flexible degrees for working professionals. JHE, one of the largest schools of continuing education in the nation, offers the master of mechanical engineering completely online or in a hybrid format. Students must choose one of four tracks in the 30-credit program: manufacturing, robotics and controls, solids/mechanics of materials, or thermofluids. The online master's degree in mechanical engineering curriculum will vary by emphasis. Core coursework includes mathematical methods for engineers, data analysis, structural dynamics and stability, and applied finite element methods. Many students are working engineers. The program can be taken full time or part time. Faculty members are mechanical engineers who are leaders in the field. Admission requirements include a bachelor’s degree in mechanical engineering or a similar major and school transcripts. The average GPA for students in the program is 3.2. NC State’s online and distance education divisions enroll thousands of learners each year because of their range of online programs. The 30-credit MS in mechanical engineering is designed for students with a BS degree in mechanical or aerospace engineering, or a related engineering field. The curriculum, which does not require any on-campus visits, is delivered asynchronously and includes courses in mechanical design engineering, composite structures, and advanced materials. Three credits of project work in mechanical engineering are required. Students must take a minimum of four courses in a concentration area. Learners are required to work with an adviser to develop a plan of study before they complete 15 credits. The online master's in mechanical engineering can be taken on a full-time or part-time basis and does not require a thesis or final oral exam. Admission requirements include a bachelor’s degree in engineering with a minimum cumulative 3.0 GPA. Lehigh's Office of Distance Education offers graduate-level programs in business, science, and engineering through an asynchronous learning platform and Classroom LIVE, which delivers courses in real time. The 30-credit MS in engineering curriculum includes courses in analytical methods in engineering, heat and mass transfer, advanced fluid mechanics, integrated product development, and three elective courses. The completion of a six-credit thesis is also required. There is also an online master of engineering option, which offers the opportunity for students to advance their engineering expertise through a concentrated plan of study that is more flexible and does not require a thesis. Both programs are designed for working engineers who want to advance their careers. Admission requirements for the online mechanical engineering master's degree includes a bachelor’s in mechanical engineering and a minimum 3.0 GPA; submitting GRE scores is highly recommended. If the student’s undergraduate degree is not in mechanical engineering, then additional coursework is required. Stevens Institute, a premier research institution located in New Jersey, offers a master’s in mechanical engineering program. The 30-credit program has two general required courses: modelling and simulation and engineering analysis. Students take at least four courses from one of seven concentrations: manufacturing; medical devices; micro/nano systems; pharmaceutical manufacturing; product design; robotics and control; and thermal, fluids, and energy. Students can choose to do either a master’s thesis or a final project. The online master's in mechanical engineering can be taken on a full-time or part-time basis. Graduates are prepared for careers in areas such as aerospace, automotive, civil, and mechanical engineering. Stevens is home to three National Centers of Excellence, including the Systems Engineering Research Center. Admission requirements include a bachelor’s degree in engineering, official school transcripts, and GRE or GMAT scores. UW-Madison online programs are taught asynchronously and delivered on a semester schedule. The College of Engineering offers a 30-credit master of engineering: polymer science for working professionals. The curriculum is designed by leaders in polymer engineering and science. The program prepares graduates to address the challenges faced by the plastics industry. Courses include the study of polymer, engineering design with polymers, modelling and simulation in polymer processing, composite materials, and experimental mechanics. The online master's in mechanical engineering degree can be completed in two to four years and is offered in a part-time and full-time format. Residents and non-residents pay the same online tuition. Admission requirements include a BS degree from an ABET-accredited program or its equivalent; a minimum 3.0 GPA during the last 60 credits; and GRE scores. The College of Engineering uses the latest technologies to deliver an MS in mechanical engineering that offers flexibility to accommodate working professionals. The 42-credit program prepares students for leadership roles with a curriculum that covers mechanical engineering analysis, computational fluid dynamics, and computational techniques. Students take 18-24 credits of electives. The program has a thesis and non-thesis option. Students can enroll in the online master's in mechanical engineering degree on a full-time or part-time basis during any quarter. Students can complete the program with two years of full-time study or three to four years of part-time study. Admitted students are professional mechanical engineers with undergraduate backgrounds that covered core principles of the field. Applicants without a bachelor’s degree in mechanical or aerospace engineering are required to pass undergraduate courses in mechanical engineering prior to entry. WPI teaches in-demand engineering skills through a 30-credit MS in mechanical engineering. The curriculum includes courses in applied analytic methods, properties of engineering methods, mechanical vibrations, and designing for manufacturability. The master's in mechanical engineering is a non-thesis program that can be completed in two years. The degree has specializations in aerospace, structures and materials, dynamics and control, fluid engineering, and design and manufacturing. Students can develop a customized plan of study with the help of an adviser. Support services include a student success team member that helps guide students throughout the program, online tutorials, and career services. Admission into the online master's in mechanical engineering program requires a BS in mechanical engineering or a similar field, such as physics or math; official school transcripts; a plan of study; and GRE scores. Texas A&M’s MS in mechanical engineering is offered through the College of Engineering. The program takes about two years to complete. The 32-credit curriculum teaches independent learning and research skills that are focused on solving engineering problems. Core coursework includes advanced product design, engineering dynamics, fluid mechanics, mechanical vibrations, and control system design. Online master's mechanical engineering degree students are required to develop a thesis and a portfolio. Graduates can apply knowledge of engineering, math, and science; identify and solve engineering problems; and use learned techniques and engineering tools in the field. Students are also taught to be effective communicators. Application requirements include a bachelor’s degree in mechanical engineering, a minimum cumulative 3.5 GPA, and GRE scores. A students’ research and engineering industry experience are considered during the application process. University of Illinois at Urbana-Champaign is home to one of the world’s largest engineering schools. The 32-credit master of engineering in mechanical engineering can be completed online through a full-time, fast-track option, which takes one year to complete; students may also enroll part time. Courses include biomechanics, solid mechanics and materials, fluid mechanics and thermal sciences, controls and dynamics, and nanomechanics and nano-manufacturing. Students have the option to take a project-based component, which allows them to earn up to four credits for an independent study project. Learners have up to five years to complete this online master's mechanical engineering degree. Admission requirements include a BS in mechanical engineering or related field. The GRE is not required. Online students pay the same tuition, regardless of residency. Case’s School of Engineering prepares students for leadership roles in mechanical engineering and to conduct research that benefits society. The Department of Mechanical and Aerospace Engineering offers the 27-credit MS in mechanical engineering, an online program comprised of seven required courses and two electives. Required courses include advanced engineering analysis, advanced dynamics, fatigue of materials, vibration of problems in engineering, and energy systems. Admission into the online master's mechanical engineering degree program requires a BS in engineering, GRE scores, and school transcripts. Online students pay one tuition regardless of in-state or out-of-state residency. The School of Engineering has developed a scholarship program for online students in mechanical engineering. Graduates are prepared for careers in industry, government and private research, and education. University of Central Florida's 30-credit MS in mechanical engineering is completely online and offers three tracks: the accelerated BS to MSME track, the mechanical systems track, and the thermofluids track. The BS to MSME option allows students to complete their bachelor's degree while taking graduate courses; the mechanical systems track teaches mathematical methods, dynamics and continuum mechanics, and mechanics and materials; and the thermofluids track teaches mathematical methods, fluid mechanics and classical thermodynamics, and heat transfer. Each track offers thesis and non-thesis options. Student support includes peer-assisted learning, real-time consultation with online tutors, and online access to the UCF library. Admission into the online master's mechanical engineering degree program requires a bachelor’s degree and GRE scores. A bachelor's in aerospace engineering, mechanical engineering, or a related field is recommended for the mechanical systems and thermofluids track. Purdue offers a quality education and world-class research opportunities. The online 30-credit MS in mechanical engineering, designed for professional engineers looking to enhance their skills, provides students with flexibility. Learners develop a plan of study with an advisor that addresses their career goals and interests. Courses include biomechanics, acoustics and noise control, automotive systems, heat transfer, and mechanics and vibrations. An Interdisciplinary MS in engineering (MSE/MS) with a mechanical engineering concentration is also available. Students can complete both programs in a part-time or full-time format. Thesis and non-thesis degree options are available. Purdue is home to the Birck Nanotechnology Center and Zucrow Labs, the largest academic propulsion lab in the world. Admission into the online master's mechanical engineering degree program requires a bachelor’s degree in mechanical engineering, a minimum cumulative 3.2 GPA, and GRE scores. New Mexico Tech’s Academic Center for Technology uses a live, web-based format to administer four graduate programs, including the 30-credit MS in mechanical engineering. The program has four areas of specialization: explosives engineering, fluid and thermal sciences, mechatronics systems engineering, and solid mechanics. Coursework will vary by specialization, and students get to choose their electives. Learners can enroll in a part-time or full-time format. The online master's mechanical engineering degree requires students to complete a thesis or independent study project and report. The school has a number of organizations for engineers, including chapters of the American Society of Mechanical Engineers and International Society of Explosives Engineers. Applicants must hold a BS in mechanical engineering, though students with bachelor’s degrees from related science or engineering fields may be considered. RPI is the oldest technological college in the nation, with graduates who have developed inventions such as the digital camera and email. The school’s Department of Mechanical, Aerospace and Nuclear Engineering is dedicated to conducting groundbreaking research and providing innovative education. The 30-credit master’s of engineering in mechanical engineering is delivered using a hybrid format. The program uses a curriculum that includes embedded applied projects that allow students to learn through application; they can also choose projects that are applicable to their own interests. Coursework includes engineering project management, mechanics of solids, finite elements, manufacturing processes, and Lean Sigma Six. Applicants to the online master's mechanical engineering degree must have a bachelor’s degree in mechanical engineering or a related field. Learners must submit GRE scores if they have less than three years of work experience. CSU’s Department of Mechanical Engineering prepares graduates to address challenges that emerge in the field. The 30-credit master of engineering, mechanical engineering specialization, which can be completed in two years, focuses on materials engineering. The 15-credit core curriculum includes course subjects in metals and alloys, materials issues in mechanical design, materials engineering, and advanced composite materials. In addition to the core curriculum, students have the option to choose electives that align with their career objectives and interests, such as cell and tissue engineering or bioengineering. Graduates can apply their skills to a number of fields, including healthcare, renewable energy, automotive design, and aerospace. Admission into the online master's mechanical engineering degree program requires a bachelor’s degree in engineering or an engineering-related field with a minimum 3.0 GPA and coursework in physics and calculus. Online students pay the same tuition, regardless of in-state or out-of-state residency. Michigan Tech has one of the nation’s largest mechanical engineering departments in the country. The 30-credit MS in mechanical engineering can be completed in one year and provides students with a curriculum that is tailored to their interests, including research and expanded coursework. Three plans of study are offered for the online master's mechanical engineering degree: the thesis option, which includes required coursework and a thesis; a report option, which includes required coursework and a report with results from an independent project; and the coursework-only option. Online students engage in an immersive education that utilizes video conferencing, live streaming, and interactive technologies to facilitate learning from a distance. Admission requirements include a bachelor’s degree in mechanical engineering or a related field and GRE scores. The average student has a GPA of 3.3. For more than 140 years, Missouri S&T has educated leaders in the fields of technology, computer science, business, and engineering. Through the school’s Distance and Continuing Education programs, students can earn a master’s degree, such as the 30-credit MS in mechanical engineering online. The program, which has a thesis and non-thesis option, is delivered through live streaming and archived for students to access asynchronously. The online master's in mechanical engineering curriculum includes courses in control systems, environmental systems, instrumentation manufacturing processes, materials science, mechanical design and analysis, and thermal science. The program is offered completely online, but students are able to conduct research in the school’s labs and centers under the guidance of faculty. Admission requirements include a bachelor’s degree in mechanical engineering, aerospace, or a related engineering or science field; a minimum 3.0 GPA; and GRE scores. The graduate program in mechanical engineering at UM-Dearborn is the oldest graduate program at the college. The 30-credit MS in engineering in mechanical engineering has two areas of focus: mechanical science and thermal/fluid science. Students have the option to take half of the program’s credits in an emphasis area. All students are required to take advanced engineering analysis, math, and cognates coursework. The remaining curriculum varies by specialization. Graduates have experience using the latest technologies in the field, can analyze and solve advanced problems in mechanical engineering, and can apply the latest techniques and tools in their profession. The online master's in mechanical engineering degree has a fully online or hybrid delivery option; both use the Canvas learning management system. Admission requirements include a bachelor’s degree in mechanical engineering or a similar field with a minimum cumulative 3.0 GPA. University of Cincinnati's College of Engineering and Applied Science’s master of engineering in mechanical engineering degree provides a practice-oriented, industry-focused online program that enhances skills in design and manufacturing. The 30-credit online master's degree in mechanical engineering can be completed in 18 months and is a non-research degree that does not have a thesis requirement. The coursework, taught by faculty with industry experience, includes the study of production planning and control, design for manufacturability, intelligent systems theory, lean manufacturing, and supply chain management. The required capstone course has students engage in a project, develop a report, and present the findings to faculty and peers. Admission requirements include a bachelor's degree with a minimum 3.0 GPA from an ABET-accredited college; the GRE is not required. The program offers several start dates throughout the year. UT Tyler’s Department of Mechanical Engineering provides students with hands-on, student-focused education. The MS in mechanical engineering includes courses in intermediate solid mechanics, heat transfer, advanced thermodynamics, and system dynamics. Three degree plans are available: a thesis option with at least 30 credits of coursework, including a six-credit thesis; a non-thesis option with 36 credits of coursework; and a professional development option with 36 credits of coursework and a comprehensive exam. Students may transfer up to nine credits of relevant coursework into this online master's degree in mechanical engineering. Graduates can apply mechanical engineering knowledge to system dynamics, thermos-fluids, and solid mechanics; use engineering tools for analysis and design; and conduct research in problem-solving. Admission requirements include a bachelor’s degree in mechanical engineering from an ABET-accredited program, an acceptable GPA within the last 60 undergraduate credits, and the GRE. UT Arlington offers 14 master’s programs, including the MS in mechanical engineering. The College of Engineering administers the program asynchronously through Blackboard. Each student works with a faculty adviser to develop a plan of study in his or her area of technical interest, which includes thermal science, mechanical design and manufacturing, and controls and systems. Coursework includes fluid dynamics, thermal conduction, dynamic systems modeling, and special topics in mechanical engineering. 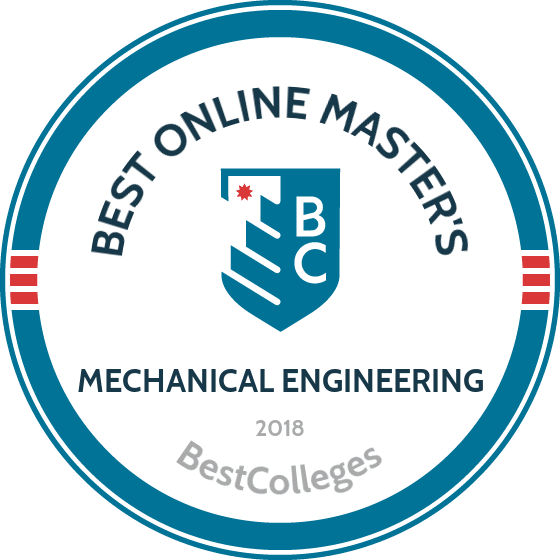 The online mechanical engineering master's degree offers students enhanced technical competencies in mechanical engineering; training through hands-on experiences in research, design, and development; and individual study under the supervision of faculty. The school has several engineering facilities, including the the Civil Engineering Lab and the Engineering Research Building. Admission requirements include a bachelor’s degree in mechanical engineering or science, a minimum cumulative 3.0 GPA, and GRE scores. The curriculum for each online master's in mechanical engineering program will vary from school to school. Programs in this rapidly evolving field typically include courses in advanced mathematics, computational engineering, thermal systems analysis, heat transfer, combustion, renewable energy, nanotechnology, and robotics. Despite the wide variety of options, there are some courses that you will find in any online master's in mechanical engineering program. Below are a few examples of these fundamental courses. Thermodynamics: This course reviews the first, second, and third combined laws of thermodynamics, the fundamental concepts of temperature, thermodynamic properties, and systems, and statistical thermodynamics. Students interested in thermodynamics may be interested in a career with NASA or a private contractor as an aerospace engineer. Introduction to Renewable Energy: This survey course covers the developments in renewable energy, its applications, and its economic and societal impact. The course emphasizes principles and practices of energy conversion, including solar energy, bioenergy, wind, and hydrokinetic energy. The demand for this specialization is anticipated to increase within the next decade, especially for solar and wind power technical engineers. Automation and Robotics: This course covers topics like robot kinematics and dynamics, design of sequential control circuits and ladder diagrams, robotic design and applications, and control of robotic equipment using electronics, programmable automation controllers, computers, hydraulics and pneumatics. This is another rapidly expanding specialization with new employment opportunities for mechanical engineers in fields like robotics software development. Internal Combustion: In this course, students are introduced to the fundamentals of internal combustion engines, emission formation, combustion in homogeneous charged and in compression ignition engines, and the effect of design and operating variables, control, and instrumentation. Expertise in this area can lead to employment as a combustion/performance/emission engineer in a wide range of industries. Air Pollution Engineering: This specialized course emphasizes the environmental aspects of combustion processes, air quality and emission control, pollutant formation, and control of pollutants, particulates, and contaminants. Students trained in air pollution engineering can pursue careers as pollution control specialists, who are responsible for designing, testing, and recommending equipment to companies and providing environmental impact assessments. How Long Does It Take to Get an Online Master's in Mechanical Engineering? The curriculum requirements for each online master's in mechanical engineering degree vary greatly from school to school. Some programs include only coursework, while others have internship or thesis requirements. In general, you should plan on earning your degree in one to three years. There are also other factors that can impact how long it takes to earn your degree, such as course delivery method and whether you plan on studying full- or part-time. Asynchronous course delivery can allow you to complete coursework at your own pace, which can make it easier to earn a degree in less time. On the other hand, synchronous course delivery makes it easy to predict how long it will take to earn a degree because of its fixed scheduling. When searching for the right school for you, be sure to choose one that is accredited. Academic accreditation shows that an institution is regularly reviewed by an accrediting agency, ensuring that they meet certain quality standards. There are two main types of accreditation: regional and national. Regional accreditation is considered more prestigious than national accreditation and is typically earned by public nonprofit universities. On the other hand, national accreditation is usually pursued by for-profit colleges and trade or vocational schools. The best online mechanical engineering master's programs also hold specialized accreditation from the Accreditation Board for Engineering and Technology (ABET), a nonprofit organization that evaluates degree programs in the natural and applied sciences, computing, and engineering. In the U.S., academic accreditation agencies are overseen by the U.S. Department of Education (ED) and the Council for Higher Education Accreditation (CHEA). ED is a cabinet-level agency that oversees policies and federal assistance to schools throughout the country. CHEA is a nonprofit organization affiliated with 3,000 schools that recognizes 60 accrediting agencies and advocates for self-regulation through these agencies. Both organizations perform important quality control functions in the areas of curriculum, admissions, degree requirements, faculty, facilities, finances, and more. You can access databases that include lists of all accredited institutions in the U.S. on the ED and CHEA websites. Mechanical engineers are in high demand, especially in industries that adopt the latest technological and software advances. To become a successful mechanical engineer, you must have strong competencies in mathematics, management, and computer design and application. You should also have demonstrable skills in problem-solving and applying creativity towards solving complex engineering tasks. The advanced training you'll receive while earning an online master's degree in mechanical engineering will prepare you for a variety of rewarding employment opportunities, including the following options. These professionals are responsible for designing aircraft, spacecraft, satellites, and missiles and developing the software needed to create models and perform simulations. Aerospace engineers are employed in one of two broad specializations: aeronautical engineers work primarily with aircraft and propulsion, while astronautical engineers develop applications for space science and technology. Aerospace professionals who want to advance their career must obtain an advanced degree and other professional development opportunities. Industrial engineers are responsible for improving operations, increasing production rates, implementing efficient practices, and eliminating waste in manufacturing. Many industries rely on these professionals for their ability to develop strategies that will enhance quality control, speed, and safety. Mechanical engineering is the most in-demand and broadest engineering specialization and prepares students for a variety of career opportunities in research and manufacturing. Mechanical engineers are responsible for designing, building, and testing tools, engines, machines, and all types of other mechanical and thermal devices. Many industries now require a master's in mechanical engineering or a related discipline, along with industry-specific certifications and EIT licensing. The need for environmental engineers continues to grow as businesses and government agencies push to protect our natural resources. These professionals use technology to manage land, air, and water resources, reduce pollution, and enforce environmental regulations. The more challenging and better paying opportunities require graduate training in mechanical engineering with a specialization in environmental science, ecology, resource management, or other related areas. The demand for civil engineers in the public and private sectors is consistently strong. These specialists are indispensable to all kinds of small and large-scale construction projects, such as buildings, roads, airports, bridges, waterworks, and sewer installations. The job outlook for civil engineers is promising, especially for those with a master's degree. Graduates with a master's degree in mechanical engineering have access to a wide variety of careers. Their median salary is $84,190, with compensation determined through a combination of skills and training, geographical location, and years of experience. Earning a mechanical engineering master's degree online can help advance your career and qualify you for a higher salary. When choosing between online mechanical engineering programs, pay attention to the kinds of specializations offered at each school and so that you can choose a degree that will help prepare you for your long-term career goals. In general, those who have professional work experience, graduate degrees, certificates, licenses, and other specialized training will command higher salaries than those in entry-level positions. For many students, the biggest challenge when pursuing a mechanical engineering master's degree online is paying for it. The first step for all students should be filling out the Free Application for Federal Financial Aid (FAFSA). This can help you determine if you are eligible for scholarships, student loans, or work-study opportunities through the federal government. There are also funding opportunities that are targeted for certain demographics in STEM programs. The HENAAC Conference supports Hispanic students in STEM education, and the Society for Women Engineers and several corporations assist women in mechanical engineering programs. Finally, the Society of Black Engineers offers several scholarships for undergraduate and graduate students.